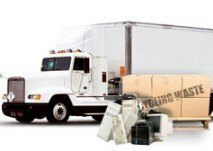 For larger facilities (over 150,000 square feet), Bulk Pickups offered by Air Cycle can provide a cost effective solution for recycling large amounts of intact or crushed lamps, ballasts, batteries, or electronic waste. Request a quote, or schedule a pickup online or by phone (800-909-9709). Pricing depends on your facility location and quantity of waste picked up. The recycling team will coordinate a pickup date that works best for you. Your packaged waste is picked up and delivered to a certified recycling partner located across the country. Once the waste has been recycled, you will receive a Certificate of Recycling, confirming the proper handling of your waste.